March 5 asteroid Earth-flyby: exactly how close will it get? Tuesday, June 14, 2016, 3:11 PM -	Images sent back from Saturn by NASA's Cassini space probe have revealed something very interesting. Some mystery object created a large disruption in the planet's thin, wispy F ring. In all of Saturn's expansive system of icy rings, the most unusual of them is the thin, wispy F ring, which lies just beyond the main disk. 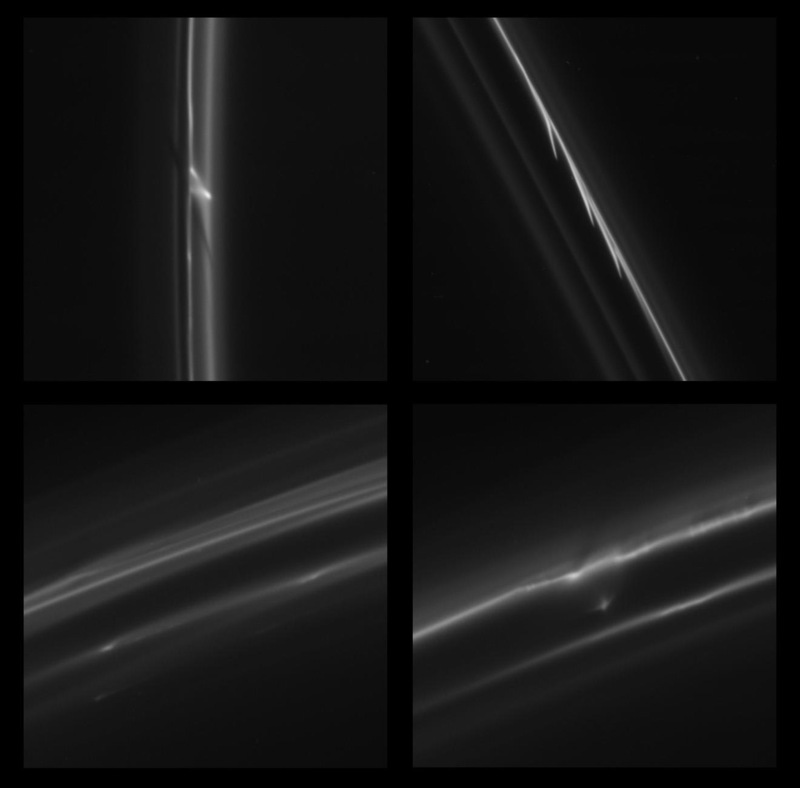 Shepherded by the gravitational influence of the planet's tiny moon, Prometheus (which does not make an appearance in these images), the F ring frequently sports strange patterns and structures, such as braids, clumps, ripples and jets. 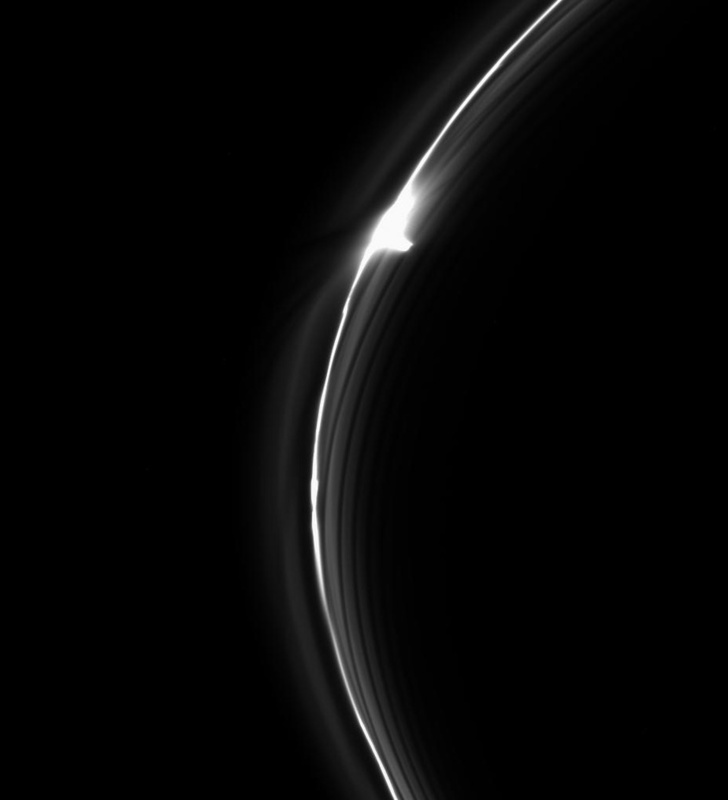 On April 8, 2016, NASA's Cassini spacecraft was outbound on one of its orbits around the planet, when its cameras captured something large and unusual along this thin ring. Based on the size of Pandora - the potato-shaped moon that shows up to the lower-right, around 25 seconds into the animation, just after the disruption enters the field of view - this break in the F ring appears to be around 700 kilometres long, and roughly 100 kilometres wide. 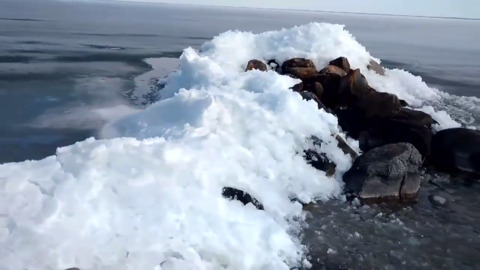 For an Earth-based comparison, you could fit Lake Erie and Lake Ontario, end to end, in this disruption, and you'd still have some room to spare. What's the cause of the disruption? Although Pandora is very close by, and the brightest part of the disruption appears to be "reaching out" in that direction, Cassini scientists do not believe that Pandora is responsible. Although Pandora was once thought to shepherd the F ring, just like Prometheus, more recently it was found that only Prometheus has a strong influence on the ring's shape. As for Prometheus, it was apparently on the other side of Saturn from this feature at the time these images were taken. More likely, it was created by the interaction of a small object embedded in the ring itself and material in the core of the ring. Scientists sometimes refer to these features as "jets." 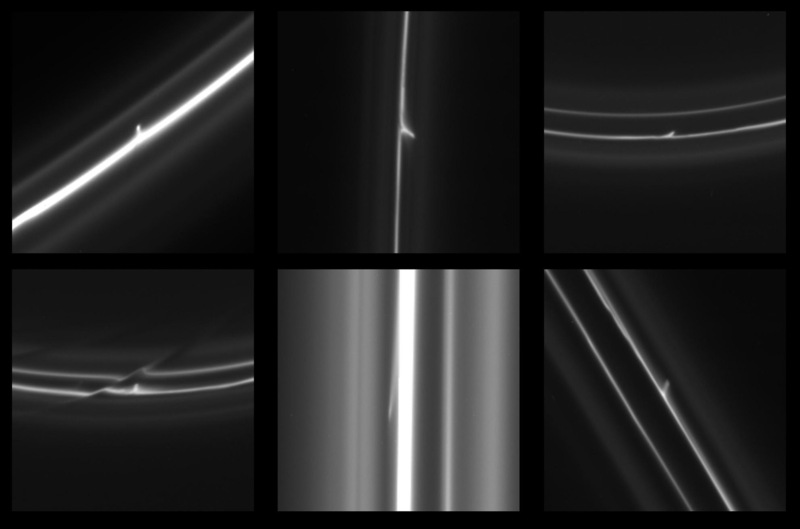 Because these bodies are small and embedded in the F ring itself, they are difficult to spot at the resolution available to NASA's Cassini spacecraft. Instead, their handiwork reveals their presence, and scientists use the Cassini spacecraft to study these stealthy sculptors of the F ring. 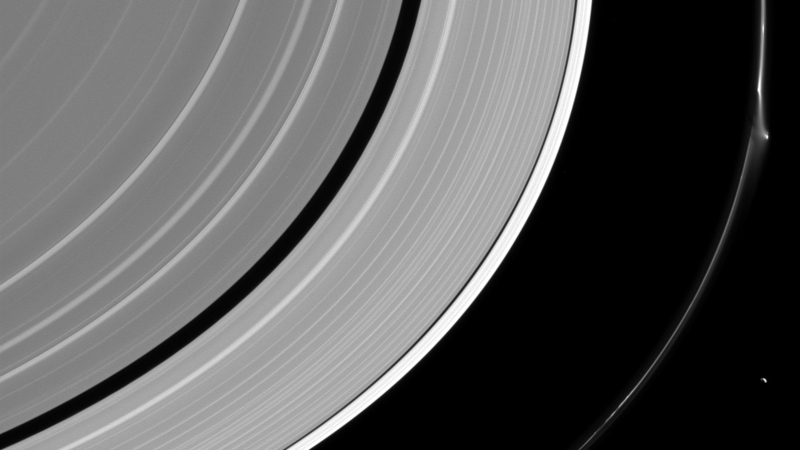 This isn't the first time Cassini has spied these unusual features in the F ring. Here's a small sample of interesting ones captured by the spacecraft since its arrival at Saturn in 2004. Top row (left to right): Images from Aug. 2, 2005, Nov. 12, 2006, Jan. 7, 2008, May 5, 2007 and Aug. 20, 2008. Bottom row (left to right): Images from Jan. 7, 2008; May 10, 2008, Aug. 20, 2008, June 10, 2009 and June 10, 2009. As Cassini has showed us over the years, these features in the F ring are temporary, due to the influence of the various other objects around it. Accordingly, the latest images of this disturbance, taken on June 10, 2016, show that this instance is no different. 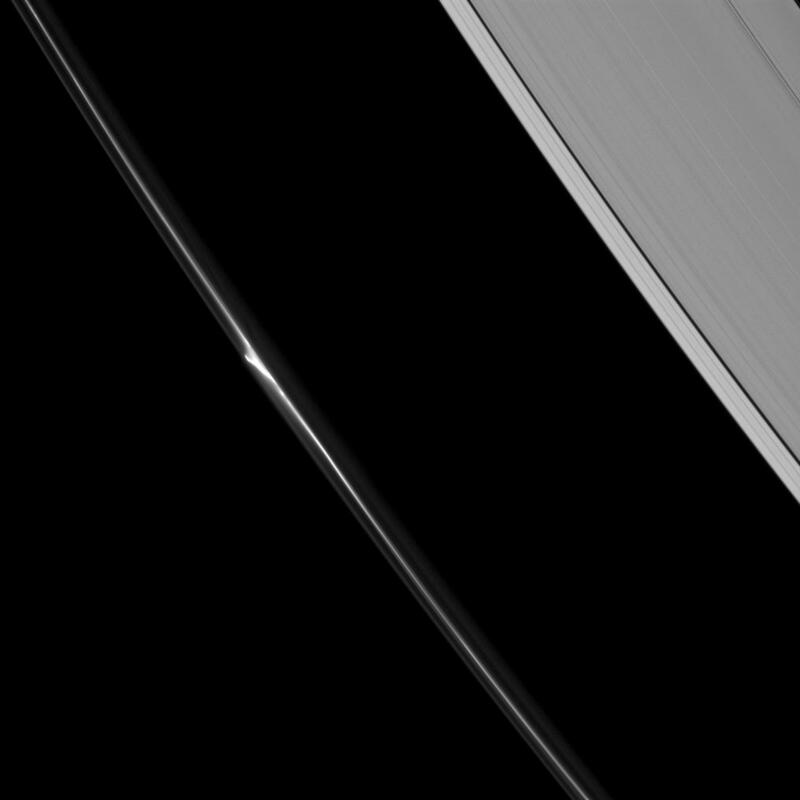 In the animation below, the same elongated bright region of the ring precedes the location of the disturbance, however the disturbance itself has already been closed, and now exists as just a bright clump in the ring. Cassini has been operating at Saturn, taking countless images and providing valuable new information about our solar system's ringed giant, for nearly 12 years now. The mission is in its last days, however. We have until September 15, 2017 to enjoy these amazing views of Saturn, its rings and its moons. That's NASA's planned end-of-mission date for the spacecraft, as once it runs out of fuel for its maneuvering thrusters, it will make as many orbits as possible, zipping between Saturn and its inner rings, before diving into the planet's atmosphere. Watch Below: Cassini team member Carl Murray talks about why he considered Saturn's F ring to be the weirdest.